One of the most popular holiday destinations along the Southern Costa Blanca coastline, Cabo Roig is a beautiful and desirable resort. Renowned for its clean sandy beaches, its lovely marina and its excellent strip of bars, shops and restaurants, Cabo Roig offers everything you need for a great family holiday. Though it is very busy during the summer months it is actually a superb location for a holiday any time of the year. Easy to reach from both Alicante and Murcia airports, Cabo Roig is handily placed for visiting other attractions along the Costa Blanca and Costa Calida. One of the best known sights in Cabo Roig is the 16th century watchtower around which Cabo Roig primarily grew. The watchtower was one of many built along this coast to look out for approaching Berber pirates who frequently attacked villages along the coastline. The watchtower now looks down on the recently renovated marina with its 200 plus moorings. Cabo Roig boasts a couple of excellent clean sandy beaches and these are a big draw for the holidaymaker during the hot summer months, they do however rarely get uncomfortably packed and you can usually find a nice spot to sit and enjoy some serious sunbathing. The beaches are well maintained and safe for children and pedalos are available for hire for those who want a little exercise and adventure. Be sure to try out the well known cliff walk which runs from Cala Caleta beach to La Zenia beach, this is an ideal way to spend an evening during the bright summer months and will provide a very welcome cooling breeze on those hot muggy days. The walk offers some picturesque views of the sea and coastline and there are some interesting coves to explore along the way. The climate in Cabo Roig is warm and temperate and it is considered to be one of the healthiest places to live. The summers are warm and dry with temperatures sometimes reaching 40 degrees centigrade in July and August, the average temperature through the year is approximately 20 degrees centigrade with winter temperatures rarely falling below 10 degrees. Rainfall is scarce and occasional and occurs mostly during the winter. For food, drinks and entertainment the majority of visitors head for the busy Cabo Roig strip (located on both sides of the N-332 coastal road), here you can find a tremendous variety of bars, restaurants, fast food establishments and shops. During the summer months there is plenty of live entertainment available plus the usual array of karaoke, bingo and quiz nights. The list of things to do in and around Cabo Roig is endless, here are just a few suggestions - take a trip into the nearby town of Torrevieja and visit the huge Friday market (the biggest in the region), in the afternoon take the kids to the Aqua Splash Park (Aquopolis) with its enormous water slides and lovely picnic area. Visit one of the many ancient Spanish cities in the region, choose from Murcia, Orihuela, Cartagena, Elche or Alicante - all have a good selection of attractions that are worth a visit. Try out the Go-Karts at Punta Prima, great fun for kids and adults, or visit the nearest circus - there are plenty to choose from during the busy summer months. There you have it - Cabo Roig, "the jewel of the Costa Blanca", the seaside resort with something for everybody. Be sure to visit sometime soon. Cabo Roig lies just off the N-332 road between Torrevieja and Pilar de la Horadada, and is just a twenty minute drive from San Javier (Murcia) airport. Also close by is the AP-7 motorway which will get you to Alicante airport in around forty five minutes. About the Author - Newspaper contributor Steve Locke resides in Cabo Roig on the sunny Costa Blanca, Spain. 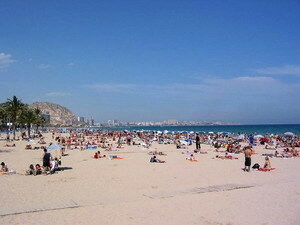 His website is a wonderful resource for information on the Costa Blanca and surrounding areas. To see pictures and more information on Cabo Roig follow this link:- http://www.needahandspanishproperties.com/cabo-roig.html.